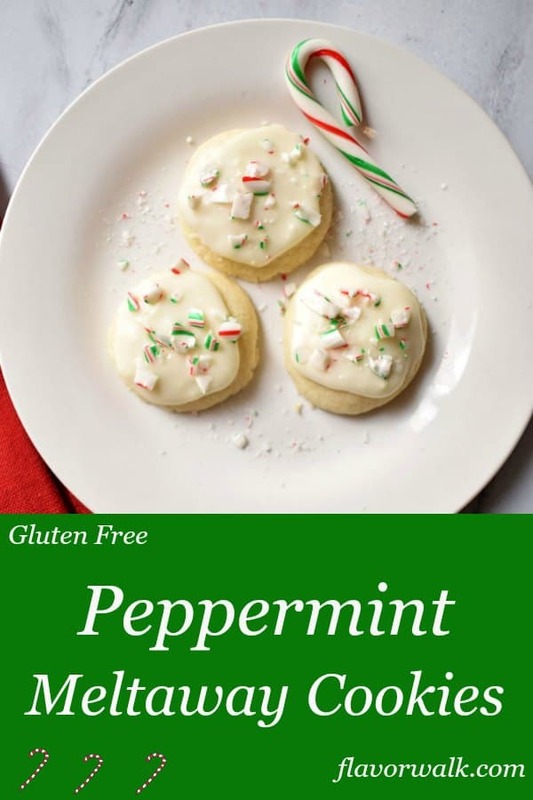 Gluten Free Peppermint Meltaway Cookies are sweet, tender, and easy to make. This simple frosted cookie, topped with crushed candy, is melt-in-your-mouth delicious! These peppermint flavored treats make a festive addition to any holiday cookie platter. Once you try them, you might want to keep them all for yourself. The holiday season always brings out my desire to bake, but there’s never enough time to make everything. 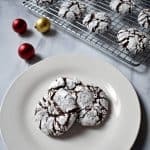 I have to limit my recipe choices, but these gluten free peppermint meltaway cookies made the list. There’s something about the flavor of peppermint, at Christmas time, that seems so right. 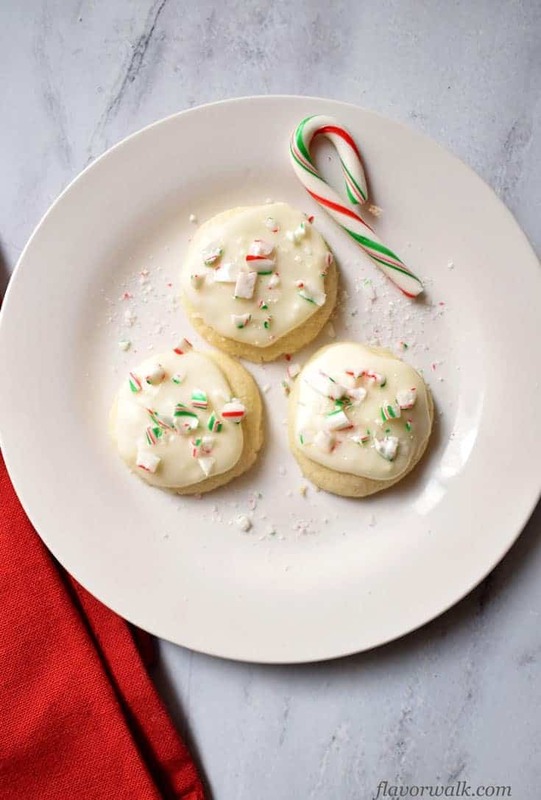 The cookies are topped with crushed candy canes. What could be better than that? These meltaway cookies are made with just a few simple ingredients. You do need to chill the dough, but you can leave it in the fridge for several hours until you’re ready to bake. Beat together the butter, powdered sugar, and peppermint extract until creamy. Whisk together the gluten free flour and cornstarch. Slowly beat the flour mixture into the butter mixture. Cover and refrigerate the dough until firm. Shape the chilled dough into balls. Place the dough balls on ungreased baking sheets and bake at 350-degrees for 10-12 minutes. Cool the cookies on a wire rack. Beat the frosting ingredients together adding additional milk or powdered sugar to achieve the desired consistency. 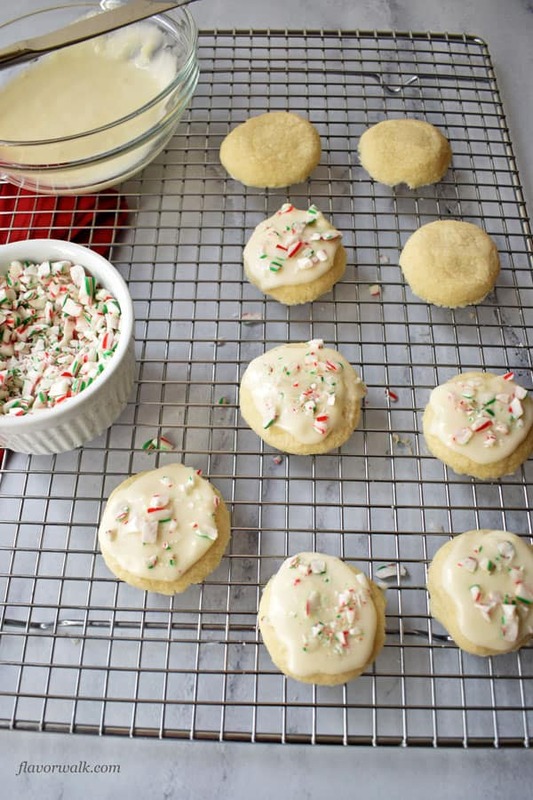 Frost the cookies and sprinkle the crushed candy canes over the tops. Check the ingredients in your gluten free flour mix for xanthan gum. If your flour mix doesn’t contain xanthan gum, try adding 1/2 teaspoon to the recipe. I used Bob’s Red Mill Gluten Free 1 to 1 Baking Flour which has xanthan gum in it. When forming the chilled dough into balls, use the warmth of your hands to make the dough more pliable. Cool the baked cookies completely before frosting. The frosting will slide off a warm cookie. If you prefer a thicker frosting, increase the amount of powdered sugar to achieve the desired consistency. To crush the candy canes, remove the wrappers, break the canes into 1-inch pieces and seal in a Ziploc freezer bag. Place an old kitchen towel over the bag and crush the pieces with a hammer. I put a piece of wood under the bag of candy before using the hammer. You can also crush the candy, with a few pulses, in a food processor set on low. 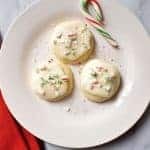 If you’re looking for a simple and tasty cookie recipe to add to your collection of favorites, give these Gluten Free Peppermint Meltaway Cookies a try. They’ll make a festive addition to your holiday baking. Enjoy! Find more tasty recipes in the Recipe Index. Gluten Free Peppermint Meltaway Cookies are sweet, tender, and easy to make. This simple frosted cookie, topped with candy, is melt-in-your-mouth delicious! In large mixing bowl, combine butter, powdered sugar, and peppermint extract. Beat at medium speed until creamy. In small mixing bowl, whisk together gluten free flour and cornstarch. Add the flour mixture to the creamed mixture in 2 or 3 portions, beating on low speed after each addition. Continue beating until completely combined. Transfer the mixture to a smaller bowl, cover with plastic wrap, and refrigerate for one hour. Roll the dough into 1-inch balls and place 2 inches apart on ungreased baking sheets. Bake for 10-12 minutes or until cookie bottoms are lightly browned. 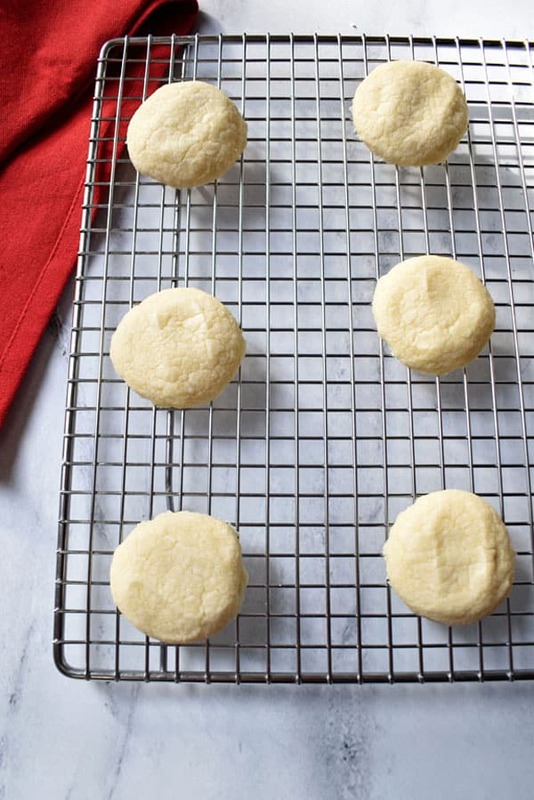 Allow cookies to cool on baking sheet for 3 minutes before removing to wire rack to cool completely. Beat the butter in a small mixing bowl until fluffy. Add the milk, peppermint extract, and powdered sugar and beat until smooth. 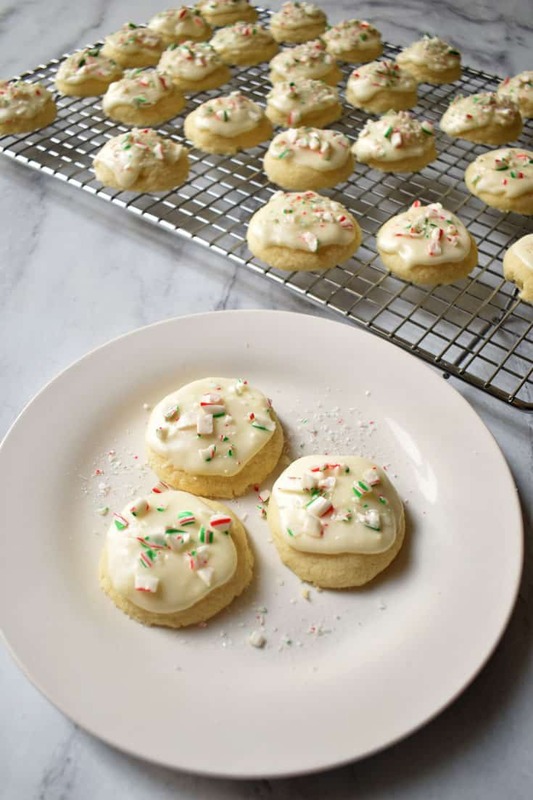 Spread frosting on cooled cookies and sprinkle with crushed candy canes. Check the ingredients in your gluten free flour mix for xanthan gum. If your flour mix doesn't contain xanthan gum, try adding 1/2 teaspoon to the recipe. Thanks Patty! I’m glad you enjoyed them. Not one for peppermint but the cookies were so good I could overlook that part.